It crossed my mind that yesterday's outburst of hysterical haiku could be one of those indicators that I need some time away from work. 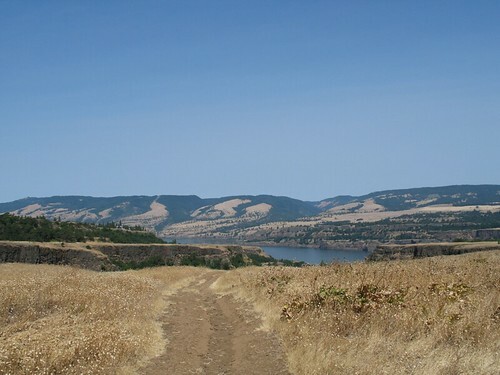 Seventy miles east of Portland, a loop of the old Columbia River Highway climbs to Rowena Plateau. A nondescript gravel turnout with a leaning sign is the only indicator that beyond the wire fence is the Tom McCall Wildlife Preserve. 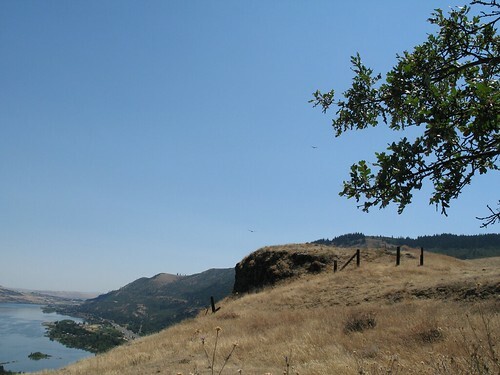 I've spent some powerful moments of my life up on Rowena, and it occurred to me today that I might not have too many chances to come this way again, since a private car is the only way to get there. I had the whole place to myself. 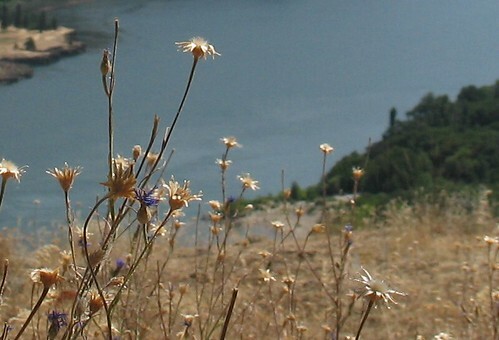 I sat under my favorite scrub oaks, out on the jut of the last cliff, several hundred feet above the river. That's all. Just sat. Waited for whatever it was I needed. It was hot and bone-dry. There was no wind. A pair of hawks came out hunting about the time all the bees were breaking for siesta. A couple of tiny freight trains went by over on the Washington side. I'm not sure what happened to the time. I sat there until I had a feeling that I'd recapitulated my whole life so far, zapped out some stuck places, communed with an angel or two, rewired part of my DNA, spoken to at least one ascended master, and sketched a plan for the rest of my life. I sat there until my legs were sunburned and my eyes were full of vitamin D and everything in me was hot and completely still. I sat there for three hours. I sat there, in short, until I'd cleared my mind. Then I stood up in the rising breeze, waved at the hawks, and drove home. I kind of was too. 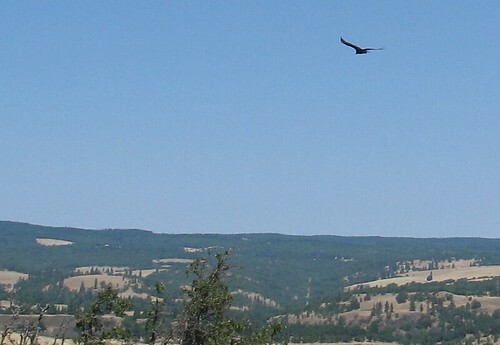 There's something about hawks gliding on hot summer thermals that is just plain poetic. It was a great day.